This view of Beasore Meadows backs up against Jones' Store, known for its burgers and homemade pie. The meadow is about 20 minutes from my studio, about 8,000 ft. above sea level and reached through a series of steep switch-backs, above Bass lake, CA. 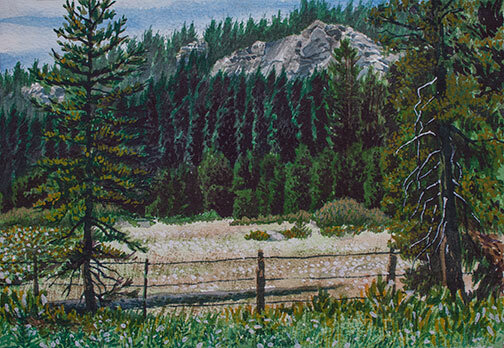 I'd traveled up that day with the plein air group from Yosemite Western Artists. It was the middle of summer and the temp at the meadow was 10 or 20 degrees cooler than that at home. Great day to be out with friends in the open air, even though the store was out of pie!